Sorry for being picky: shouldn’t the first call to MyClass.getNextId() return 1001 instead of 1000? Ed, are there any args or return value in the Ext.define or Ext.require callback? @Les no arguments given to the require callback (we may add some later). The define callback is given a single argument – a reference to the newly-defined class (e.g. MyClass in the last example above). But don’t all these preprocessors slow things down? The loading and initialization routines now seem to be split into much more stages involving a lot of copying properties between objects, calling callbacks… Although it’s clear that the new system is more flexible and has less requirements for the end developer. Ed, how a component class would dynamically load plugins? >>> Ed, how a component class would dynamically load plugins? I believe I can answer my own question:) Class is ready before the plugins that it can use are loaded. This because plugins are needed per instance of the class. So, I’d need to require the plugins before an instance of the class is created. Can a preprocessor or a postprocessor be used to automatically modify the created object? Sorry, dumb question. I thought about it afterward and realized you can do most anything either by mucking with the class or adding a constructor. This is very nice! 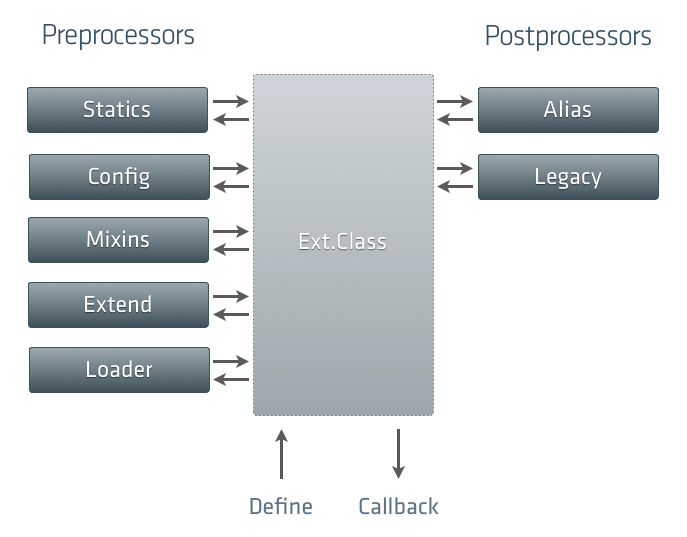 Just a thought, would building a ‘Aspect’ preprocessor be something worthwhile to consider? This would allow a sort of aspect oriented programming capabilities added to classes. I do not find a default preprocessor in Ext JS 4.0.2 source code (I look in Class.js). Also, I found the way Ext JS 4 processing preprocessors and postprocessors is strange. I think there are bugs in it. http://www.sencha.com/forum/showthread.php?143668-when-configuration-data-for-Ext.ClassManager.create-overwrite-postprocessor&p=636782#post636782 . Honestly i have no idea why ext has such a drastic changes that broke everything? Yes, this.callParent(arguments) will work, however you will have to keep your method name the same. What should be the alternative? Hooks is the 3rd arg and callback will be the 4th. Hope this helps someone that lands in this page for the same purpose as me. I do have a question for you though. I have always been confused by the config preprocesser in Ext Js. In fact I never use it. It seems to work fine in simple examples not extending anything, but if you want to use it on an Ext class it behaves oddly. For instance, if you wanted it to match Sencha Touch by wrapping the fields property, it would not play nice and your model won’t have any fields. Should it never be used on non-user declared properties? It is often required in Sencha Touch. I do hope it gets changed to at least be consistent between the frameworks in 5.x. Agreed, that doesn’t make any sense. I wrote it up here mainly so I could figure out how it works! But yea, none of it should exist (in fact I believe they’re heading back to an Ext.extend-like single function for performance and other reasons).